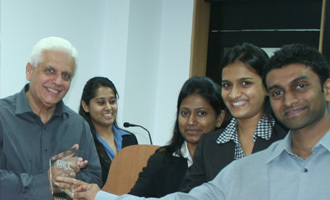 ‘Business Excellence Study– 2009 is a unique initiative of the MET Schools of Management. It is based on the TATA Business Excellence Model -TBEM, introduced by Mr. Ratan Tata in the TATA Group in the nineties to commemorate JRD Tata. The objective of this study was to help students to understand the principles of “Business Excellence” and prepare them to adopt and follow right management approaches and principles through their corporate journey.